The chairman of the Securities and Exchange Commission is likely to face an especially tough hearing in front of Congress on Tuesday, after the agency acknowledged that it also was a victim to a hack. 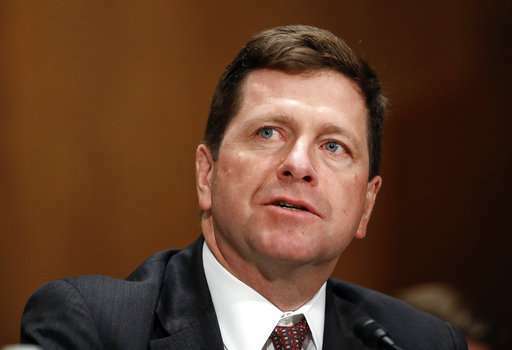 Jay Clayton, who has been at the head of the SEC since May, is not likely to face calls for his removal since the breach happened a year ago, before he was sworn in. But he may be questioned about whether the SEC—the federal government's main arm for enforcing rules and regulations on Wall Street—is up to the task of keeping data secure. Clayton will likely have to answer how probable it is that insider trading took place and what the scope of it might be. He is also likely to be asked why the commission sat on the news of this breach until August when it happened a year ago. The hack occurred despite repeated warnings in recent years about weaknesses in the agency's data security controls. Members of the Senate Banking Committee may well want to know what the SEC has done to secure its systems. The SEC's disclosure also follows one from Equifax, which said this month that information about millions of people was exposed. The SEC is currently investigating the Equifax breach, and news of the hack will raise questions about whether an agency that is tasked with sanctioning companies is unable to keep their own house in order. The SEC hasn't said which individuals or companies may have been affected or who might have carried out the breach. Experts say a hack by Chinese or Russian actors can't be ruled out. Critics say the SEC isn't meeting the same security standards it demands of corporate America.